I have an easy, yet slightly gourmet, better-for-you burger recipe today, just in time for grillin’ season! 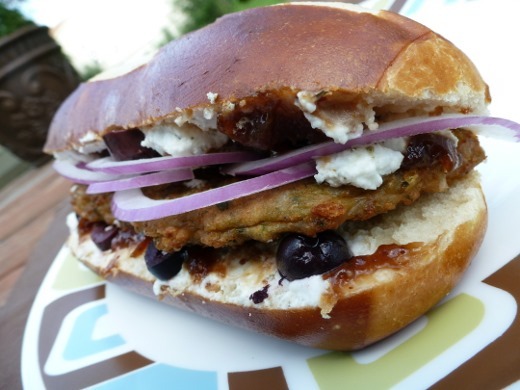 The ingredients include a few of my favorite recent foods, including pretzel rolls, kalamata olives, and fig preserves. Lately I have been obsessed with the combination of goat cheese and fig preserves. This may have been partially inspired by wine and cheese happy hours with my friend and former co-worker Five Star, so you can thank her for being a partial inspiration to this recipe! However, I needed a way to make a meal out of these two ingredients, because binging on cheese and jam isn’t exactly the most balanced meal! I think this recipe is the perfect solution, as these veggie burgers pair very well with other Mediterranean ingredients. 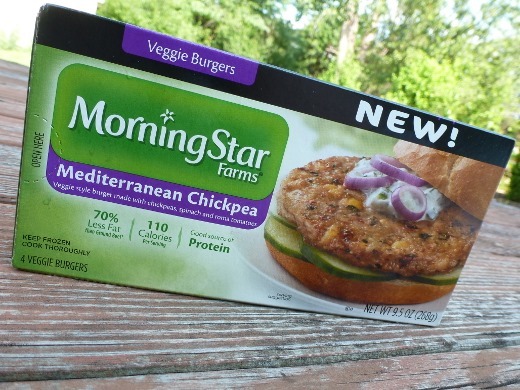 MorningStar Farms’ products have made appearances on my blog in the past. I’m a big fan of their meatless burgers. The Spicy Black Bean Burgers have traditionally been my favorite (with a slice of melted pepper jack cheese, drizzled in Sriracha – mmm! ), but this weekend I tried a new flavor. The star ingredients in this recipe are the Mediterranean Chickpea burgers. To enhance the flavor of the Mediterranean herbs in the veggie burgers, I mixed fresh goat cheese with 1/2 tsp. of Italian seasoning. Fresh herbs would be great too! The burgers are simple to cook in a skillet. Or better yet, bust out that grill! Since my burger recipe uses an oblong pretzel roll as the bun, I cut my burger into two half moon pieces, for easier sandwich assemblage. 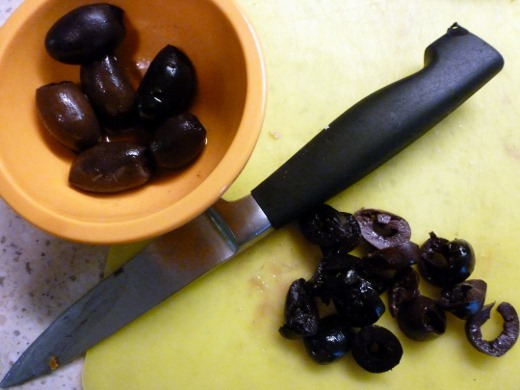 Chop up kalamata olives and thinly slice red onion to garnish your burger. This combination of flavors is so great! Summery Mediterranean veggie burger made with chickpeas, fresh herbs, spinach, and roma tomatoes. 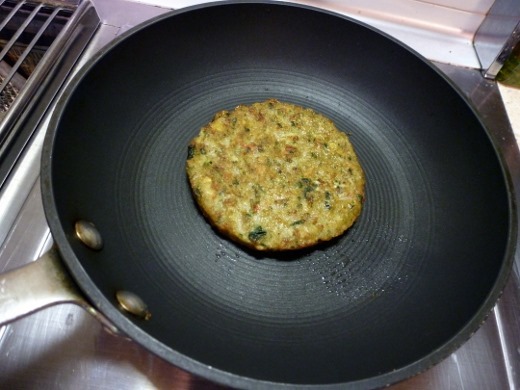 Cook MorningStar Farms Mediterranean Chickpea Burger in a skillet according to package directions. 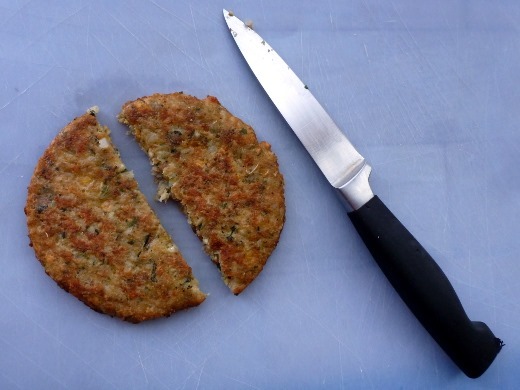 Remove from pan and slice burger in half, to form two half-moon pieces. 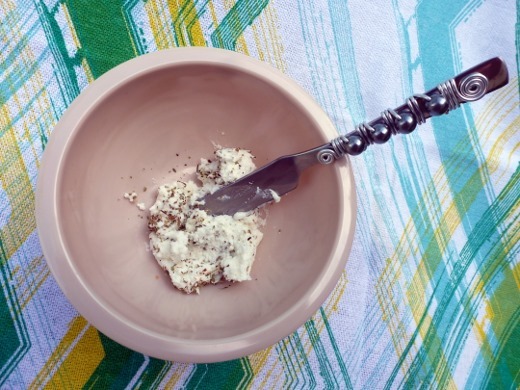 Meanwhile, in a small bowl mix goat cheese with Italian seasoning. Set aside. Slice open pretzel roll, and heat, if desired. Spread goat cheese mixture and fig preserves inside top and bottom halves of roll. 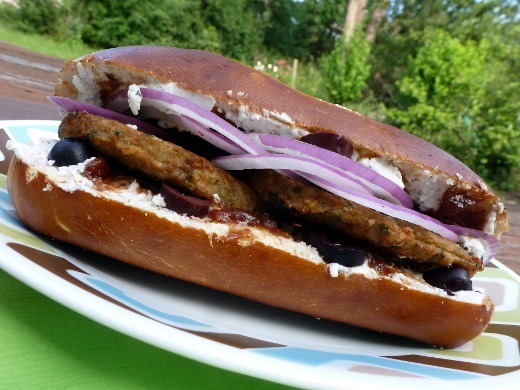 Add burger to roll, and garnish with kalamata olives and sliced red onion. 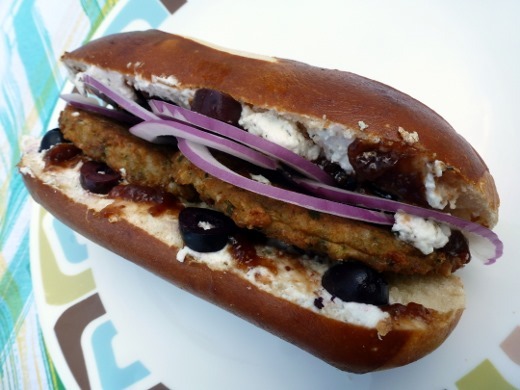 MorningStar Farms’ “Feel Good Grilling” Tour, stopping at the Plymouth Art in the Park Festival on July 12-14 and serving up local chef John Korycki’s spin on veggie burger sliders, perfect for summertime grilling. Chef John Korycki of Michigan restaurant Zazios has partnered with MorningStar Farms, and will be at the event to share some tips on how to spice up backyard barbeques with meatless, good-for-you burgers and unique toppings. I know this sounds weird, but peanut butter and sauerkraut on a veggie burger is a killer combo. Top it with some Sriracha, and you’re golden! Goat cheese and fig– nom! As for veggie friendly burger toppings, I choose Avocado and sprouts– when I did a vegan cleanse last summer, I chose avocado as a substitute for cheese on veggie sandwiches and burgers. Black bean burgers topped with guac and fresh pico is probably my favorite. Simple and delicious! I love putting Garden Fresh gourmet’s Artichoke Garlic salsa onto of Morningstars Spicy black bean burgers. Soo delicious! Love avocado and tomato on my veggie burgers! Yummy! Green olives and a thick slice of sharp cheddar cheese is delicious on a veggie burger ! So as promised, I finally checked out your blog! I definitely want to make these – they look so simple and easy! I hate complicated cooking with tons of ingredients. My fave veggie burger toppings would have to be avocado and/or some chipotle mayo! Found you via instagram, loving the blog so far! (even though you stole my plates :P) Fave veggie burger topping is some jalapeno cheddar cheese with hoagie spread. I found the hoagie spread locally at Hiller’s market. It’s made by Haddon House and is almost identical the “side of hot” you get from Izzy’s Hoagie shop that goes so great on their cheesesteak! I love salsa on my veggie burgers! Thanks for reminding me about fig preserves/goat cheese. It was a regular for me last summer but I forgot all about it this year. And putting the two on a veggie burger? Can’t wait to try that one! Fabulous giveaway! My favorite topping is carmelized onions. YUM. As for your Morning Star burger topping- I love bleu cheese and sautéed onions. Oh dang, that is awesome! I need to check that place out! Fig + gorgonzola sounds like a winner to me. Spicy black bean burger with guac, red onion, and salsa! Pingback: Dinner Meal Plan for July 14-20 | Meg.Goes.Nom.Nom. 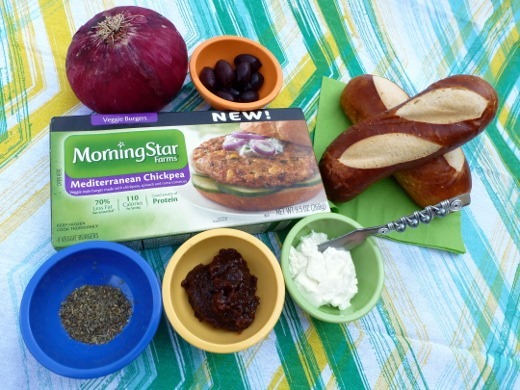 Pingback: MorningStar Farms Giveaway Winner | Meg.Goes.Nom.Nom.